You wouldn't know it listening to Iowa agricultural industry groups or state ag department officials, but a new report from University of Iowa researchers makes it clear: state farm operators are doing a lousy job of keeping nitrogen fertilizer out of the Missouri and Mississippi Rivers. How bad a job are ag businesses doing in preventing nitrates-nitrogen from seeping from their farm field drain tiles into state waterways? In the Upper Mississippi River Basin, Iowa contributes 21 percent of the water, comprises 21 percent of the land area, but is responsible for nearly half (45 percent) of nitrate-nitrogen pollution that flows into the Mississippi River. 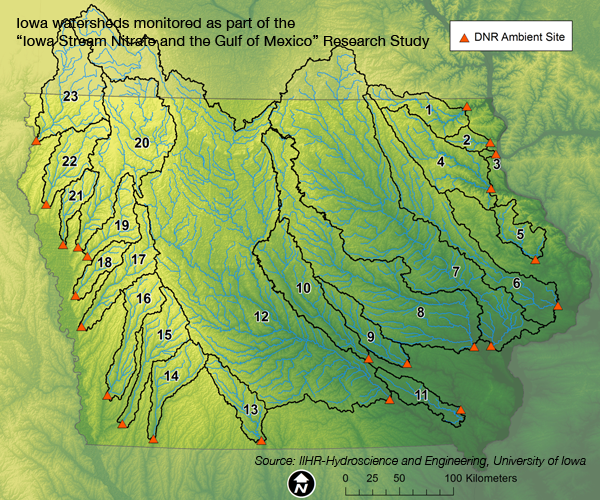 In the Missouri River Basin, Iowa contributes 12 percent of the water, comprises only 3.3 percent of the watershed land area, yet is responsible for more than half (55 percent) of the nitrate-nitrogen polluting the Missouri River. When the new Devils Glen Bridge across Spencer Creek was dedicated in late 2016, the city of Bettendorf was wise to provide directions for the news media and officials invited to the event. "At the roundabout, head north on Middle Road, continue under I-80. At approximately ½ a mile past I-80, veer left onto Indiana Road. Follow Indiana Road past Hidden Hills Golf Course," the release stated. "The bridge over Spencer Creek is shortly after that. *Not accessible from Utica Ridge Road at this time due to Davenport’s road construction project." It's also likely those who attended the dedication haven't crossed the bridge since that ceremonial ribbon-cutting.